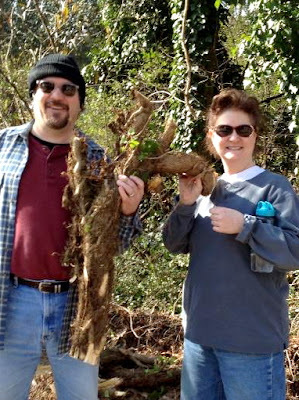 Medlock Area Neighborhood Association (MANA): Ivy season is open. No bag limit! bagged at the inaugural Ivy Pull Classic. English ivy is an invasive species that damages trees and displaces native vegetation at ground level. Our neighbor Deb noticed that many trees at the PATH entrance on Willivee appear choked with ivy and has organized a series of ivy removal events. The first took place last Saturday. Additional ivy removal is scheduled for February 9, 16 and 23, noon - 3pm. Meet at the community garden on the corner of Willivee and Scott Circle. Loppers, machetes, hand saws and pruning shears were the most useful tools at the last event. For comfort and safety, please wear long sleeves and pants. For more information, contact elkin_d at bellsouth.net.